I wrote several posts that talk about free VPN service, I know this is a best way to protect yourself online. But sometimes we can use some small secured proxy to do that job, like hide IP address, surf some blocked sites. Today, I would like share a few small free secured proxy clients. Puff is a small secured proxy client, just 800kb. Very simple interface but that is Chinese version. It is not too hard to figure out to use this client. Only five buttons on interface, from up to down: Connect Server, Off Server, Use IE With Client, Use IE Without Client, Exit Client. If you use IE browser you do not have to setup anything, but for other browsers you have to setup proxy 127.0.0.1:1984 with your browser network connection. The secured IP address is in US, you can use it to watch some US TV programs, like Hulu. 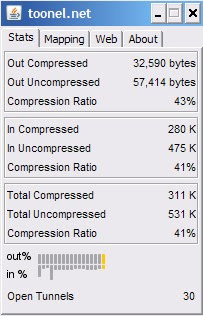 Toonel is a small java client, only 117kb. This client designed for reduce broadband, but it also can be using like a secured proxy. After you running this client, you have go to "Mapping" -> 127.0.0.1 -> "Apply" on the window. 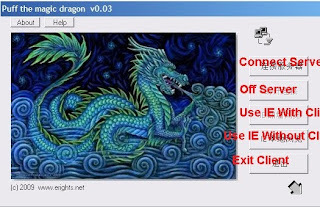 This is only thing you have to do, next step is setup your browser network connection with proxy 127.0.0.1:8080. All done. The server IP is in Germany. 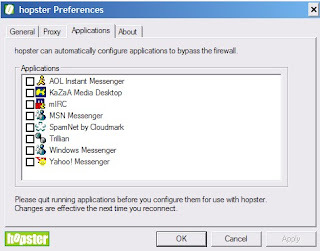 Hopster is a small http tunnel client, it designed for instant messenger, like ICQ, Yahoo Messenger, mIRC, Windows Messenger. But we can use it with some browsers which support socks proxy server. 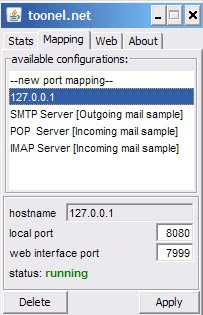 After installed client, you have to setup browser network connection with socks proxy 127.0.0.1:1080. If you want use it with your instant messenger you can pick one you wanted on interface. Compare to other two clients, Hopster seems slow, and it has a small ads window appears on the corner. The server IP is in Austria. I think best one is Puff, Toonel is OK, but Hopster is too slow and pop-up window is annoying. Introducing but I am not recommend it.